Forklifts of Toledo is your best source for all your forklift service needs. We service all make and model forklifts! 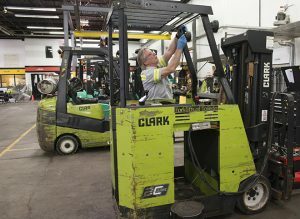 Skilled technicians work on any model forklift. You can count on fast response time to your call. Our technicians have fully stocked service vans to repair your equipment at your business. Most forklift maintenance and repairs can be made on-site. We repair all make and model forklifts. Call to schedule on-site service: 419-531-6110. Our service shop is equipped to handle the large repairs. Your large repair needs are covered at our Toledo shop location. Engine rebuilds, tire pressing, painting, fabrication and more. Pick-up and delivery service is provided and forklift rentals are available while your forklift is being serviced. Call to schedule shop service. 419-531-6110. • Planned Maintenance Programs tailored to your application. • Guaranteed Maintenance Programs from PMs to full service with loaners. Call us for fast, dependable service – No hassle… No excuses! Thank you for visiting Forklifts of Toledo Service! Shipping and receiving 7:00 – 3:00 Monday – Friday. Please call us at 419-531-6110 or use the request service form below.